NACOGDOCHES, TX (KTRE) - A candidate running for the Texas House of Representatives campaigned on Wednesday on promises of ending what he calls “corruption” and “cover-ups” in state government. 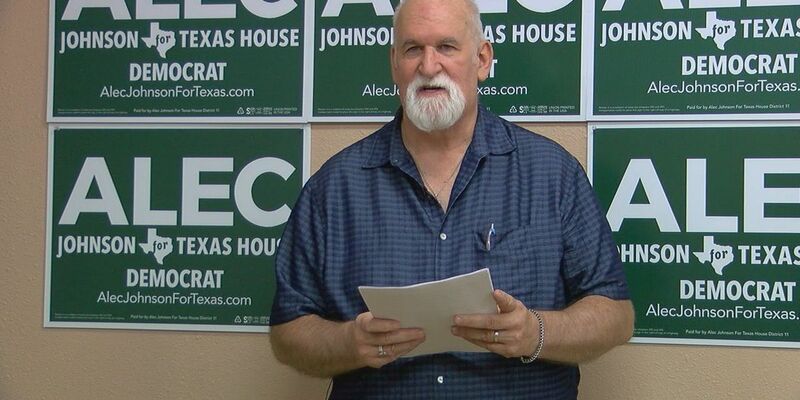 Alec Johnson, a Democrat, is running for the Texas House District 11 seat currently held by Travis Clardy, a Republican. Johnson held a news conference on Wednesday that highlighted the death of Janice Wilhelm. She was found dead in her Leon County home in 2010. Police said her death was caused by a self-inflicted gunshot wound. Authorities claimed to have found a suicide note, but her family has long denied the discovery, Johnson said. Johnson spoke at length about Janice Wilhelms’ case along with a Nacogdoches criminal defense lawyer Sean Hightower. Johnson said he believed there were inconsistencies in the case and explained what he would do to uncover the supposed truth if elected. “Part of what shocks me is that Wayne Robeson reached out to just about everyone you could imagine. He got no justice with the Texas Rangers; he certainly wasn’t getting justice with local law enforcement. He reached out to the governor, Attorney General Ted Cruz’s office, Travis Clardy’s office. He reached out to me, and it just screamed at me. If I were his elected official, I would’ve just dealt with this,” Johnson said. Johnson said his first act in office would be to urge authorities to re-open the case. Johnson will be facing on incumbent Travis Clardy in the November election.